The Grohovo Landslide, situated on the north-eastern slope in the central part of the Rječina River valley, is the largest active landslide along the Croatian part of the Adriatic Sea coast. The Grohovo Landslide is also a key pilot area for implementation of the monitoring activities of the Japanese-Croatian joint research project on “Risk identification and land-use planning for disaster mitigation of landslides and floods in Croatia”. This complex retrogressive landslide was reactivated in December 1996. It is considered that the basal failure surface is positioned at the contact between the slope deposits and the flysch bedrock. Based on the data from boreholes, geological mapping, geophysical surveys and the geological cross-section of the slope, the three dimensional shape and the position of the sliding surface were simulated using the inverse distance weighted interpolation. 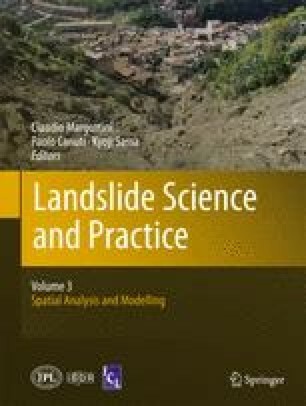 Using 3D extended Janbu’s simplified method, global stability of the Grohovo Landslide and stability of 12 separate landslide bodies were analyzed. This research was performed as a part of Japanese-Croatian joint research project on “Risk Identification and Land-Use Planning for Disaster Mitigation of Landslides and Floods in Croatia”, which was funded by JST-JICA Science and Technology Research Partnership for Sustainable Development Project (SATREPS).